Growing potatoes may not sound as glamours as harvesting watermelon, but this hearty vegetable can be used in nearly any meal and the home-grown variety are particularly tasty. Potatoes are a cool weather plant and need a bit of attention, but the results are worth it. 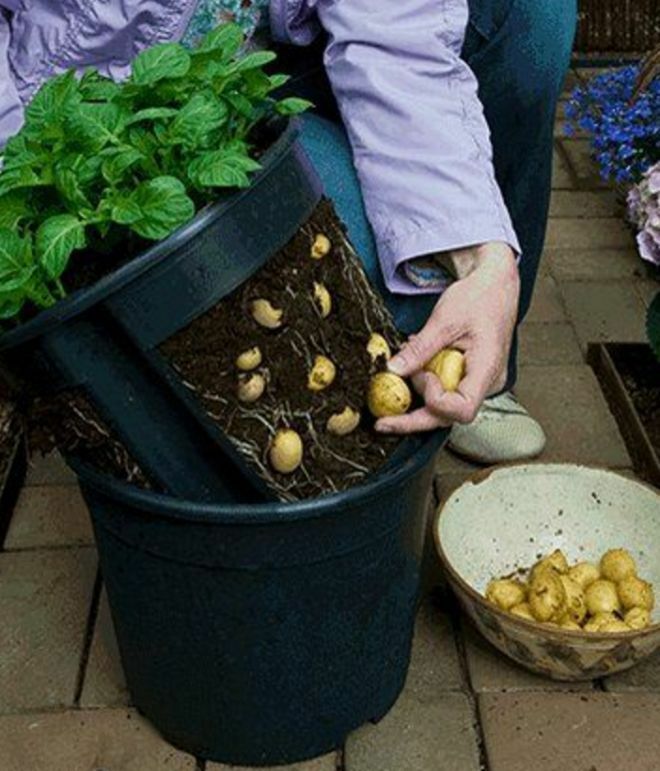 You can literally plant a potato (or pieces of a bigger one) to grow more potatoes. If you do choose to cut a larger potato, allow them to dry for 48 hours or so. This will help prevent rot and mold growth later on. Remember to plant eye side up, no matter what method you use. Potatoes are thirsty plants and need regular watering, according to The Old Farmer's Almanac. Hilled rows: The most common method (if you have plenty of space) is to plant potato seeds in a shallow trench. Each trenched row should be about three feet apart and seeds should be planted 3 inches deep. Raised Bed: Add loose soil to a half-raised bed. Make sure to space your seeds 12-inches apart on all sides and bury them 3 inches deep. Add soil as the potatoes grow to keep the roots covered. Garbage Bag: Poke a few holes in a large plastic garbage bag. Fill the bag with a few inches of loose soil and roll the edges down so your bag will stand. Add your seeds and then cover with a few more inches of soil. The bag helps capture heat. When harvest season is over, you can just tear the bag apart. 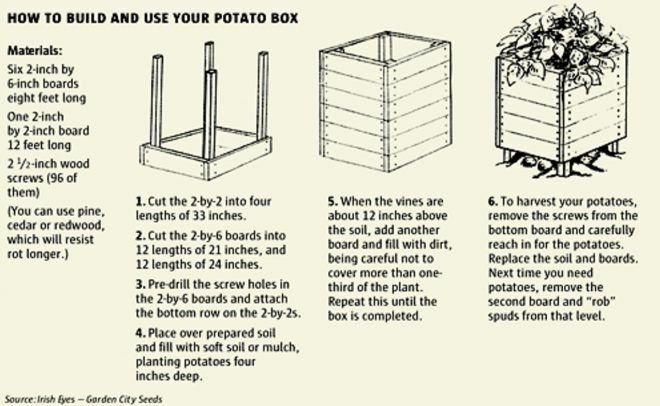 Box Method: Growing potatoes in a wood box is a simple way to create an attractive growing space that's also productive. To save on cost, built a bottomless box with pallets or other discarded wood. Start with a small box (only two planks or so high) and add more planks as your plants get higher (and require more soil). Check out the illustration below for more details on constructing the box. Add a few inches of soil to the bottom of your wood box and plant potatoes about 12-inches apart and 3-inches deep. 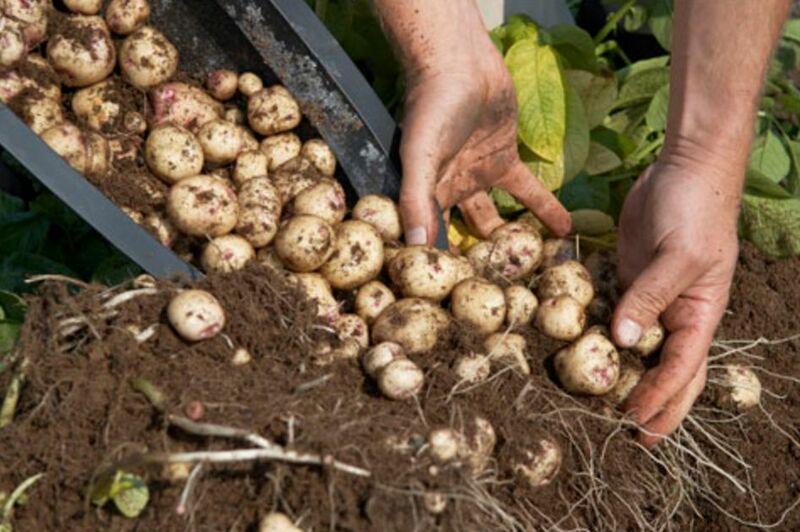 Keep the water relatively moist and make sure your potatoes stay covered to avoid sun damage. If you're living in a small space, growing potatoes may not seem optimal, but in reality, they work great as a container grow. You could use a small wooden box, or try a potato tower. Wrap bamboo posts or reed screen around chicken wire and secure in the ground with stakes. This method takes advantage of height rather than square footage. Have you tried growing potatoes? Share your experience with us in the comments below. There's so much more you can do with banana peels than just tossing them in the trash.